Bengals Considering QB With First-Round Pick? There has been talk around the league that the Bengals are considering drafting a QB with their first-round pick (No. 11 overall) in this month’s draft, per Matt Miller of Bleacher Report (via Twitter). The Bengals have deployed Andy Dalton under center since 2011, but even though he is a three-time Pro Bowler, he has never been considered one of the best passers in the game. He is under contract through the 2020 season, though Cincinnati could release him without any dead money ramifications. We heard back in December that Dalton was almost certainly going to be back with the club in 2019, but in January, director of player personnel Duke Tobin left the door open for the team to draft a future replacement. New head coach Zac Taylor, who served as the Rams’ quarterbacks coach in 2018 and whom the Bengals believe offers the same type of QB development ability as Los Angeles head coach Sean McVay, may be ready to find “his guy” in the draft and have him learn behind Dalton for a year. It seems unlikely that the Bengals will be players for the top two signal-callers in the draft, Kyler Murray and Dwayne Haskins, who will probably be off the board by the time Cincinnati is on the clock with the No. 11 pick. The Bengals do have 11 picks in total this year, but the only round in which they have multiple selections is the sixth (they have five sixth-rounders), so if they want to trade up, they would likely have to dip into their 2020 draft capital. But signal-callers like Drew Lock and Daniel Jones should be available to them if they want to go that route, and if Taylor believes in one of those players, the team may very well pull the trigger. I don’t think the Bengals are setup to win this year. Same for the Fins. If I were a GM of those teams, a a handful of others, I’d trade back in round 1-3. Build depth, accept L’s this year and grab a QB next year. But like with the Jets last season; they traded up, lost those 2nd rounders and their rookie got crushed. When does Riker’s have its Pro day? Is this supposed to be clever? Seriously? How is it’s Cincy’s fault he hasn’t live up to expectations? For the most part, players play determine how much they are embraced, so I just don’t see how it’s anyone else’s fault. 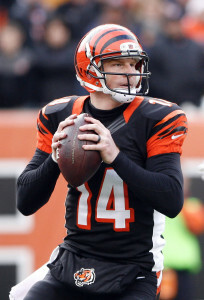 Dalton is 10th among active players in passer rating and has made 3 Pro Bowls, leading the AFC in passer rating once. So Dalton has “played” much better than his reputation. I would be shocked if the Bengals drafted a QB with that 11 pick. The thought of drafting another Akili Smith is just too frightening for them to go in that direction. If Haskins is there, and the Bengals pass on him, there will a revolt by the good folks of southern Ohio. The Bengals would be better off trying to land another Anthony Munoz. They were next to last in time of possession last season and adding a QB won’t help improve that. Dalton is still as useful as many of the leagues starters although not a game changer. This site knows that any info or “leaks” out of teams this time of year is pure misinformation right?